Crews are almost finished bridging a gap in an unfinished portion of the Foothills Parkway known as the "missing link." We go behind the road blocks to see the progress on Tennessee's oldest unfinished highway and share the splendid scenery drivers will someday enjoy. 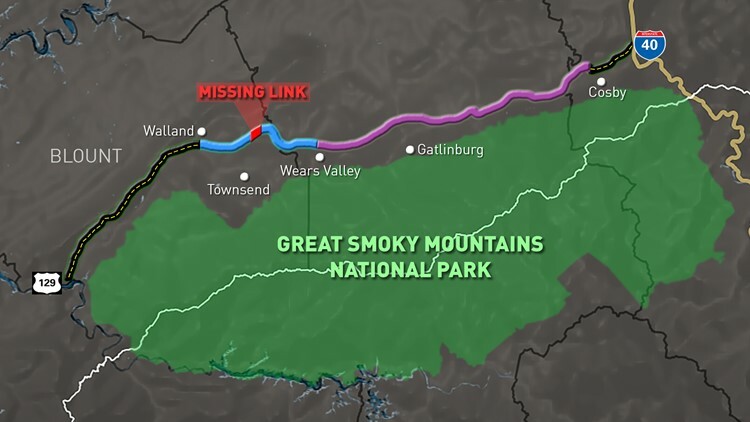 High along the ridge-tops in Blount County between Walland and Wears Valley, crews are just a few months away from finally bridging a gap in the Foothills Parkway known as the "missing link." Project manager Mike Tomkosky with the National Park Service has been driving the unfinished 16-mile section of the parkway for the last 14 years of his career. Now he finally has concrete reasons to believe the finish line is in sight. The Foothills Parkway is the oldest unfinished highway in Tennessee. Congress approved plans for the 72-mile scenic route along ridges just outside the Great Smoky Mountains National Park in 1944. In the late 1960s, crews finished a couple of sections of the parkway. On the eastern end, there’s a 5.5-mile portion that was completed from Interstate 40 to Cosby. On the opposite end, drivers have long enjoyed the 17-mile stretch in Blount County that runs from U.S. 129 to Walland. Construction along the missing link on the Foothills Parkway and a Google Earth aerial image of the ridge. Crews spent a couple of decades working on a 16-mile segment from Walland to Wears Valley and nearly finished it. But right in the middle, the construction hit rugged peaks and valleys too tough to overcome. The walls they built crumbled and the soil was filled with minerals that caused environmental damage. Construction on the missing link resumed again in 1999, but the NPS and the Federal Highway Administration ordered the Florida-based contractor at the time to stop in 2000 after four separate fatal accidents at the site. Panoramic views of the Great Smoky Mountains from the unfinished Missing Link on the Foothills Parkway. The on-again-off-again construction lingered until 2009 when federal stimulus money put the project back in the fast lane. Tomkosky said the project actually benefited from postponements because new bridge technology emerged during the decades of delays. Crews work to complete one of the five remaining bridges under construction on the Missing Link of the Foothills Parkway. After the bridges are completed in June 2017, do not expect to immediately hit the road for a scenic drive. There’s still the very large task of paving the 16-mile segment, as well as constructing parking areas at overlooks. The federal government is in the process of securing $35 million for the work. When the section from Walland to Wears Valley is finally complete, the 50-year-old project will likely carry a total price tag exceeding $240 million in today’s dollars. View from Townsend of the Missing Link construction along nearby ridges. Whenever it opens, Tomkosky says the cruise through the clouds will be worth the wait. “I can never get over the beauty of the mountains. You’re going to get panoramic views of the Tennessee side of the Smokies. It gives you that sense of floating along the mountain and you’re driving down the parkway. I can’t wait for other people to experience what I’ve been able to see as part of my job,” said Tomkosky. After the 16 miles from Walland to Wears Valley is finished, the Foothills Parkway will still be the oldest unfinished highway project in the state. There has been no construction on the 33-mile section from Wears Valley to Cosby. That project is listed “future construction,” currently has no funding, and may possibly never be built.